Fishes occur in lakes, streams, estuaries, and oceans throughout the world. In most species of fishes, all individuals live entirely either in fresh or in marine waters. Over 225 species are diadromous, regularly living part of their lives in lakes and rivers and part in the oceans. Among these, most are anadromous, spawning in freshwater but spending much of their time in the sea. A few are catadromous, spawning in the oceans but returning to freshwater. Classification of some species as marine, diadromous, estuarine, or freshwater is impossible, except as a generalization. Just as in an otherwise marine family there may be one species confined to freshwater, so in some species there are populations that occur in an environment opposite that of most others. Individuals of some otherwise marine species ascend rivers for short distances in part of their range, and those of some species that are usually freshwater are anadromous in some areas. Many freshwater and marine species are also common in brackish-water estuaries. It appears to be evolutionarily easier for marine fishes to move into freshwater than for freshwater fishes to move into the oceans. About one-third of the 515 families have at least one species with individuals that spend at least part of their life in freshwater. Berra (2001) gives much information and distribution maps for the freshwater fish families. About 11,952 species, or 43% of all species, normally live exclusively in the freshwater lakes and rivers that cover only 1% of the earth's surface and account for a little less than 0.01% of its water (the mean depth of lakes is only a few meters). About 15,800 species usually live all their lives in the oceans, which cover 70% of the earth's surface and account for 97% of its water, and have a mean depth of about 3,700 m. This descriptive information does not imply restriction to a freshwater or marine habitat, or inability to cross regions of the opposite habitat over long periods of time for all the taxa involved. Many environmental factors influence just where a certain species will predominate. Competition and other biological interactions may exert a strong influence along with physicochemical factors. In freshwater environments, species may show a preference for lakes or streams. Variations in preferences may exist over the range of a species. Among lakes they may show a preference for deep, cold, oligotrophic lakes or for shallower, warmer, and more productive mesotrophic and eutrophic lakes. In lake waters they may show a preference (horizontal and vertical) for the open-water limnetic zone, the benthic area, or shallow littoral areas. Fishes may even be restricted to certain types of bottom or do best under certain physicochemical conditions. Stream fishes may prefer riffle or quiet areas, and a zonation of species is usually found from the headwaters to the mouth. In the oceans the vast majority of fishes are coastal or littoral. Most of those living beyond the 200-m-deep continental shelf (oceanic species) are deep-sea (mesopelagic, bathypelagic, abyssopelagic, or benthic at various depths); only a small minority regularly live close to the surface in the well-lighted upper 200-m zone (epipelagic), a region much larger in volume than the coastal waters. The epipelagic and mesopelagic fishes, which consist of both large predators and small plankton feeders, are varied, whereas most of the bathypelagic and abyssal fishes are relatively small. Many species, both geologically young and old, have small ranges; the smallest is perhaps that of the Devils Hole Pupfish, Cyprinodon diabolis, found only in one spring in Ash Meadows, Nye County, Nevada. Many areas have a high degree of endemism. Marine fishes face the obvious land barriers (notably the New and Old World land masses) and midocean barriers as well as many ecological and physiological barriers; freshwater species are limited by marine and land barriers. Some species have remarkably large ranges, and it would be interesting to know why some of their relatives have small ranges. About 130 marine species are known to extend around the world in tropical or subtropical waters. Many genera are represented in both the Pacific and Atlantic, but, almost always, different species are involved. 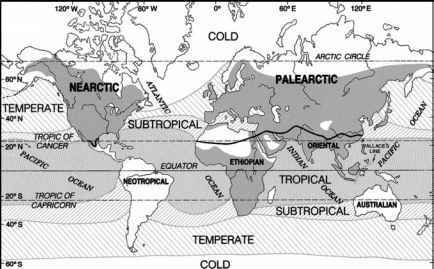 Representatives of many marine genera and of some species occur in the temperate and polar faunas of both hemispheres. Individuals of some of these bipolar or antitropical taxa are surface-bound; others are deepwater. The vast majority of species, however, are tropical; most of the rest occur only in the Northern or only in the Southern Hemisphere. We know little of the abyssal depths and their species composition. Many abyssal species have been found at widely separated localities, which suggests that some may be virtually worldwide. No freshwater species is circumtropical, but two species, Esox lucius and Lota lota, are circumpolar and several others are almost so. No genus of freshwater fish has an antitropical distribution. Many freshwater fishes have shown a remarkable ability to disperse across newly exposed land areas following glaciation. In addition, they may occur in isolated waters in deserts as a result of a reduction of waters from times when drainage systems were connected. In both fresh and marine waters, the largest number of species occurs in the tropics. There is a reduction toward the polar areas, although numbers of individuals in certain northern species are large. A great many species of freshwater fishes occur in tropical Africa, southeastern Asia, and the Amazon River—by far the world's largest river. For a tropical region, Central America has relatively few freshwater species because of the physiography and geological history of the area. Most oceanic islands lack indigenous fishes confined to freshwater, and continental areas recently exposed from the last ice age— for example, northern regions of North America, Europe (especially western Europe), and Asia—tend to have a relatively sparse fish fauna. In tropical areas, Africa exhibits the greatest diversity of nonostariophysan freshwater fishes; South America exhibits surprisingly little. In temperate areas, eastern North America shows the greatest diversity in nonostariophysan fishes. In marine waters, the Indo-West Pacific (Red Sea and Indian Ocean to northern Australia and Polynesia) is the richest, with the most species occurring in the New Guinea to Queensland area. In terms of diversity, southeastern Africa and Queensland appear to have the largest number of families of marine shorefish. The West Indian or Caribbean fauna (southern Florida to northern Brazil) is also a rich one. The western African fauna, however, is relatively poor. Arctic and Antarctic faunas are depauperate. In all, the greatest number of fish species in the world inhabit the southeastern Asian region. Broad surface thermal zones of the ocean, biogeographic regions of the continents, and native distribution of the family Cyprinidae, the most species-rich family of vertebrates. The biogeo-graphical regions express degrees of endemism and are useful indicators of numbers and proportion of endemic organisms. I rarely use the continental regions in the text, and ichthyologists do not use them as much as in former times; the Nearctic and Palearctic are frequently combined into one region, the Holarctic. The thermal divisions of the sea denote tropical (or warm), subtropical, temperate, and cold (or polar) waters; warm temperate is sometimes used for all or part of the subtropical and warmer parts of the temperate (vs. cool temperate) waters. Surface isotherms, used to define thermal regions, are subject to seasonal and annual changes. Major biogeographic regions recognized in the oceans include the Indo-West Pacific, tropical western Atlantic, tropical eastern Atlantic, North Pacific, North Atlantic, and Mediterranean-East Atlantic. Marine oceans share different similarities with one another; for example, in many families the tropical eastern Pacific shows a greater resemblance to the western Atlantic than to the Indo-West Pacific because of the mid-Pacific barrier and the relatively recent marine connection across the Isthmus of Panama. Information on the generalized thermal zones is based partly on Briggs (1974) and modified by numerous other sources. Distribution of the family Cyprinidae, shown by the shaded land area, is based on Berra (2001) and papers in Winfield and Nelson (1991). The science of biogeography attempts to document the geographic distribution of taxa (descriptive biogeography) and to explain their distributional patterns (interpretive biogeography). It is an active field of study in ichthyology and is rich in problems. There are two extreme approaches to interpretive biogeography. First, ecological biogeography attempts to determine the environmental factors—such as oxygen concentration, temperature, turbidity, salinity, currents, and competition—limiting the distribution of individuals of a species within a body of water or over the range of the species. Second, historical biogeography attempts to explain the origin of distributional patterns and is usually done in conjunction with, and is based upon, systematic studies. Of course, this includes paleontological studies, where the age of fossils must be fairly considered (remembering that fossils indicate minimum ages and that their record is very spotty). Factors such as presumed paleocli-matic changes are often invoked in historical biogeography, especially when postulating that discontinuous distributions result from dispersal events. Aspects of both ecological and historical biogeography, combined with a knowledge of geology, geography, and systematics (usually below the species level), are important in studies of species dispersal following glaciation (such as in northern Eurasia, North America, and New Zealand) or uplift of land from the ocean (Central America, for example), or of dispersal through drainages submerged following glaciation (such as Indonesia). Various methodological and philosophical approaches are used to explain the origin of distributional patterns of fishes, including areas of endemism. Both dispersal and vicariant events are important. Dispersal is regarded here as the movement, active or passive, of individuals to areas new to the existing population. Barriers of varying effectiveness may be involved as well as varying degrees of chance of reaching particular sites. It is of greatest biogeographic significance if the breeding range of the species is increased. Vicariance is the fragmentation of a former continuous distribution of the ancestral group into geographically separated units through the appearance of a barrier—for example, through plate tectonics. Both dispersal and vicariant approaches are used to explain disjunct distributions (the occurrence of a taxon in different areas with a marked geographical gap between them). 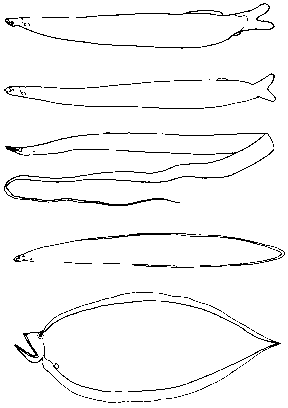 Examples of disjunct distributions include the following: occurrence of Prosopium coulteri in western North America and in Lake Superior; Geotria aus-tralis and Galaxias maculatus in Australia, New Zealand, and South America; cottids and agonids in cool temperate waters of the Northern and Southern Hemispheres; characiforms and aplocheiloids in Africa and South America; and osmeriforms in temperate waters of the Northern and Southern Hemispheres. Plate tectonics had a profound effect on the distribution of many freshwater and marine fishes (e.g., it probably explains the occurrence of characiforms in South America and Africa). Students should read widely on the subject. There are many recent books available on biogeography and numerous articles in such journals as Cladistics, Journal of Biogeography, and Systematic Biology. The fields of systematics and bio-geography are attracting much exciting activity. There is every reason to believe that future ichthyologists will keep the field alive, and that we will achieve a stronger understanding of relationships and explanations of distributional patterns.